Although many other online slot games boast superior graphics and features, the Fisticuffs Slot Machine still packs a punch. The theme suits sports fans especially as the graphics represent motifs from the glory days of boxing. 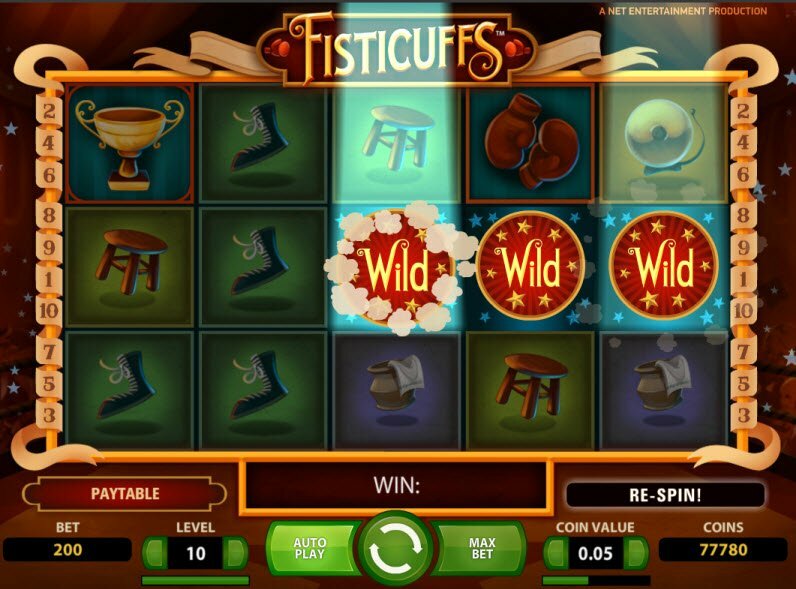 The Fisticuffs Slot also has some unique features that maximize your chances of winning more money. 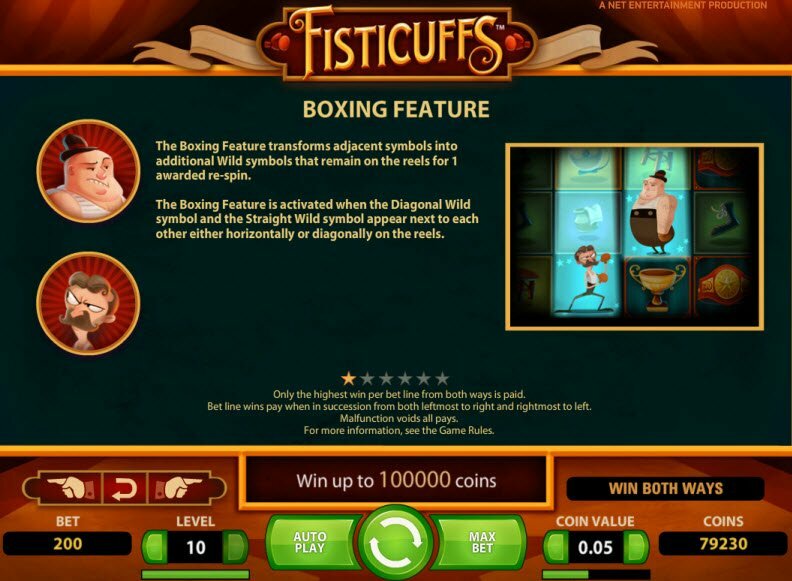 Powered by Netent, the Fisticuffs Slot Machine features 5 reels and 10 paylines. The online game recreates the look and feel of an early 1900s boxing match. Keep an eye out for the Boxing Feature that transforms all tiles adjacent to the boxing opponents into wild symbols. You’re sure to earn the grand prize with this online slot available on both PC and mobile devices. Initially, the graphics look too simplistic. However, keep playing and you’ll realize the game recreates an early 20th century boxing match. Revisit the glory days of boxing with the Fisticuffs Slot Machine. Spin the reels and images of boxing trophies, belts, sneakers, gloves, and other blur across the screen. Listen as fans cheer on the action when the reels hit a winning combination. The Boxing Feature lets you get in on the fight. When the two opponent boxers, the Diagonal and Straight Wild Symbols land in reels adjacent to each other either horizontally or vertically, the boxing round begins. These Features Are a Hit! The Boxing Feature lets you get in on the fight. When the two opponent boxers land in reels adjacent to each other either horizontally or vertically, the boxing round begins. This feature transforms adjacent symbols into additional Wild Symbols that remain on the reels or 1 awarded re-spin. During the Boxing Feature, the Wild Symbols remain on reels for 1 re-spin. The fat boxer serves as the Straight Wild and the skinny boxer represents the Diagonal Wild. 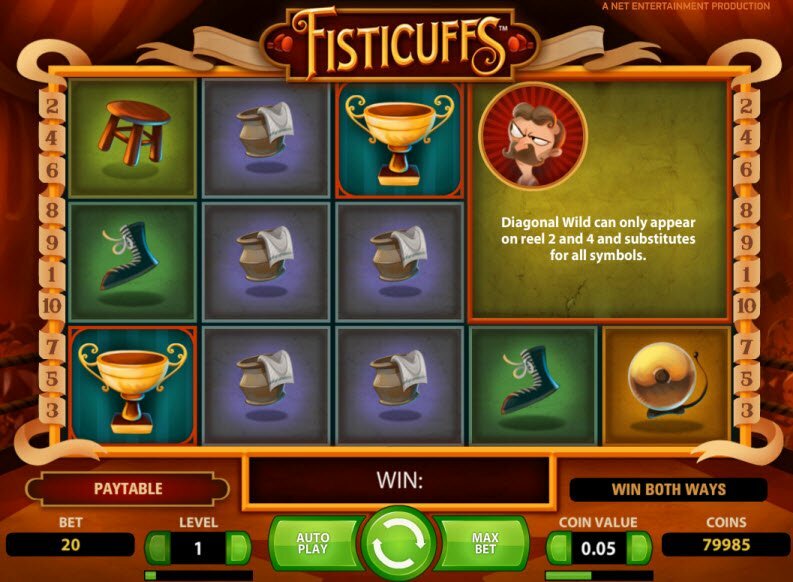 Fisticuffs Slot Bonuses also feature the option of clicking on reel boxes to see the value of different symbols. I really prefer games with this feature because it makes playing an online slot much more convenient and easier to understand.